Clearing out the clothing clutter! In what used to be my dining room, I have loads and loads of junk. It is time to reclaim the space though and a couple of weeks ago I made a dent in the junk by dealing with several bags of clothing. These include stained and ruined clothes, baby clothes, clothes that no longer fit but are otherwise fine and clothes that are starting to show a little wear and tear. So what did I do with all these clothes? Well I decided to start with the stained, ruined and worn and torn clothes and decided that the only option for me was to take them to the textile bank. If you live near one of the textile recycling companies you can even get paid for recycling your ruined clothes (not much mind, but it is way better than chucking them in the bin!) 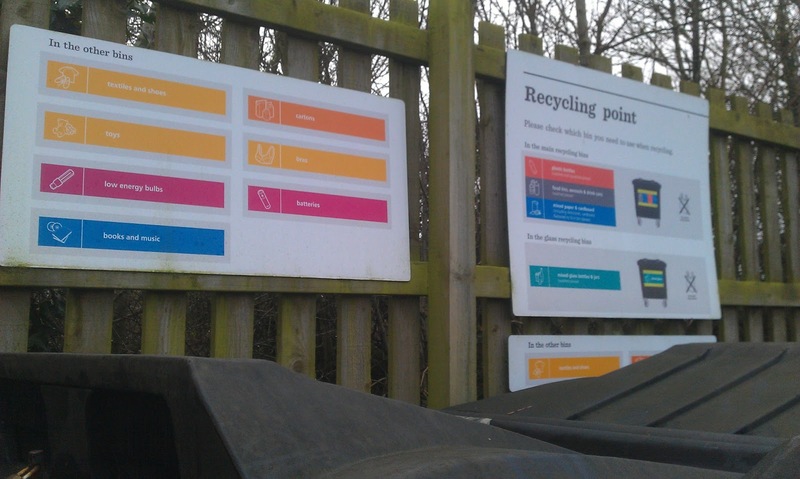 Otherwise the money raised from textile recycling usually goes to charity or the council if it is a council bin. If I had wanted to though I could have shredded these clothes myself and made stuffing for cushions, soft toys, pillows, duvets, or even made a rag rug. However all those things take time and energy and I don’t currently have a need for any of them. So I googled my nearest textile bank and found one 5 mins drive from my house – I felt good about this option as the clothes and money raised from them will benefit others! Giving the lot to charity – easy option, just dump and run! Asking local friends with babies if they want the clothes – still a fairly easy option as I could pop over and drop the clothes off quite quickly, however none were the right size. Give stained and ripped clothes to my youngest’s nursery. They always need spare clothes for the kids that have accidents or pour paint all over themselves and I have given lots of clothes to them in the past! Selling the clothes at an NCT nearly new sale (not so easy option – need to work out when the next sale is and label all the clothes up and provide them at the appointed time). The NCT take a percentage of the proceeds and I don’t have that many good quality clothes left to sell. Selling the clothes on Gumtree or the Friday ad – items are free to list and someone local can come and collect them from you. Giving the clothes away via Freecycle or Freegle – items are free to list and someone is likely to be round fairly quickly to collect your stuff! Launch into a large variety of upcycling projects! Saving them for wrapping gifts in! As I don’t have a job and although I would love to just give the lot to charity or away via freecycle, I need to maximise what I have and try and make a little bit of money from all these clothes. Assessing the options I decided to put the clothes that are in good condition in the loft to sell at a car boot sale. There are so many small items that the idea of labelling/ listing them somewhere seems like too much hard work. Plus I quite like spending a summers day at a car boot sale! I also saved any damaged jeans for future upcycling projects! Next up are my clothes that are in good condition, but just don’t fit any more. Offering my clothes to a friend and this has worked well in the past when I swapped almost a whole wardrobe full of clothes with a good friend! However this time they are the wrong size. I decided that seeing as I am going to do a car boot sale anyway, I will try selling my clothes there as well. I bagged up all the clothes (as pictured at the top) and put labels on them. I took a leaf out of A Thrifty Mrs‘ book and wrote the labels on the backs of some envelopes. Then I stuck them on with sticky tape. I had a good day and removed quite a lot of stuff from my dining room – I still have a bit more to do though! What would you have done with all those clothes? I would love to hear your hints and tips! This entry was tagged clothes, clutter, decluttering, eco, Frugal, Green, recycle, reuse, thrifty, upcycle. Bookmark the permalink. I bet your neighbour was pleased Jen! My wife and I have been de-cluttering lately. Most of our stuff goes to Goodwill. It's not to far from home and we know the items are going to a good cause. I've also passed along a few unwanted items to some people at work. I feel good about getting rid of all this stuff. It's SO nice to have SPACE where there was once a bunch of STUFF. I agree Michael, getting rid of stuff makes you feel good! 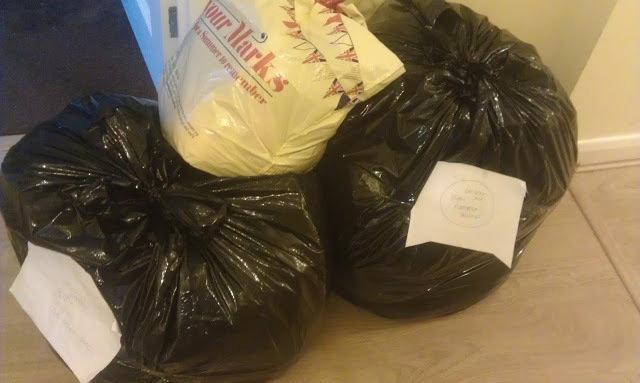 I bag up clothes and sell them to Cash for Clothes .. dont get a lot but every penny counts! At least you are getting something for them Anglesey Allsorts!